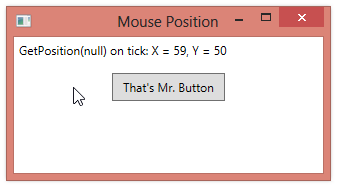 You typically only use the Mouse.GetPosition method when the mouse pointer is within the boundaries of your application’s main window. 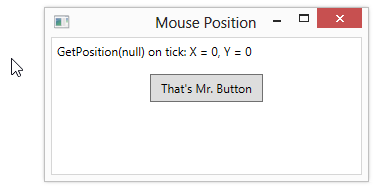 When the mouse is located outside of the window, calling GetPosition with a null value will return 0 values for the mouses X and Y position, regardless of where the mouse is located on the screen. In the example below, we are updating a label to dump out the value returned by Mouse.GetPosition when a timer fires, ever second.